In 1965, Bert Kaempfert was commissioned by the American film company Universal Pictures to compose the music for “A Man Could Get Killed” – a comedy film about a gang of crooks. Set in Portugal’s capital Lisbon, the film’s main ingredients were a diamond robbery, secret agents and a romance; two of the leading roles were taken by Melina Mercouri and James Garner. The present disc, recorded in 1966, includes the two main themes from the film: But Not Today, heard during the Main Title, and, of course, Strangers In The Night, the love theme, which was entitled Beddy-Bye in the film score. But Not Today is proof enough that Bert Kaempfert was not only capable of writing a lovely film melody but that he also knew how to capture a Spanish-Portuguese touch, even adding a dash of Greece as a tribute to the unforgotten Melina Mercouri. 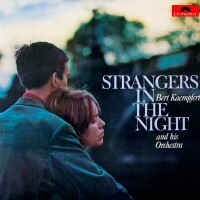 In those days Bert Kaempfert could scarcely have foreseen that his love theme Strangers In The Night would become an international Super-hit within an amazingly short time and that it would, to this day, take its place among those songs which have received the most awards. Bert Kaempfert’s publisher, Hal Fein, instinctively knew the true value of this song which he offered to Frank Sinatra, who immediately recorded it and thus made his great comeback. After only a few weeks, Frankieboy’s vocal and Bert Kaempfert’s orchestral versions took the charts by the storm and even ousted the Beatles, the Rolling Stones and the Beach Boys from their places at the top of the international hit parades. In Germany alone Fremde in der Nacht was available contemporaneously in four different vocal versions, and in 1967 this composition was named the “Hit of the Year” by the German copyright society GEMA. But it is not only these two film melodies that are worth a mention. I Can’t Give You Anything But Love, Mexican Shuffle and Tijuana Taxi were also enormously successful; Bert Kaempfert’s Milica, also known as Sweet Maria, was also a huge hit, particularly in the USA; and finally his Two Can Live On Love Alone was chosen by the Anita Kerr Singers for their album entitled BERT KAEMPFERT TURNS US ON.